Sweetie, the first graduate of the ASPCA Behavioral Rehabilitation Center’s (BRC) new campus, is off to a stellar start with a loving family and confidence-building skills. Sweetie was first found with other puppies in an Oklahoma field. Where she and her littermate, Honeysuckle, managed to evade searchers trying to transport them. Eventually the two pups wandered back to the area and were rescued by a local resident who was kind enough to drive them from Oklahoma to North Carolina. Fortunately for Sweetie and Honeysuckle, the Asheville Humane Society generously opened its doors to the ASPCA so that while the last few months of construction took place on the BRC’s new campus in Weaverville, North Carolina, the program itself could kick off. Working with her to calm anxiety by using praise and treats as motivators, BRC staff taught Sweetie to walk on leash, accept petting and handling by people, spend time in a crate when necessary and ride in cars. Staff focused on reducing Sweetie’s fear rather than teaching her to do things like sit, lie down and come when called, and encouraged her adopter to look into a reward-based obedience class to build the bond between them. 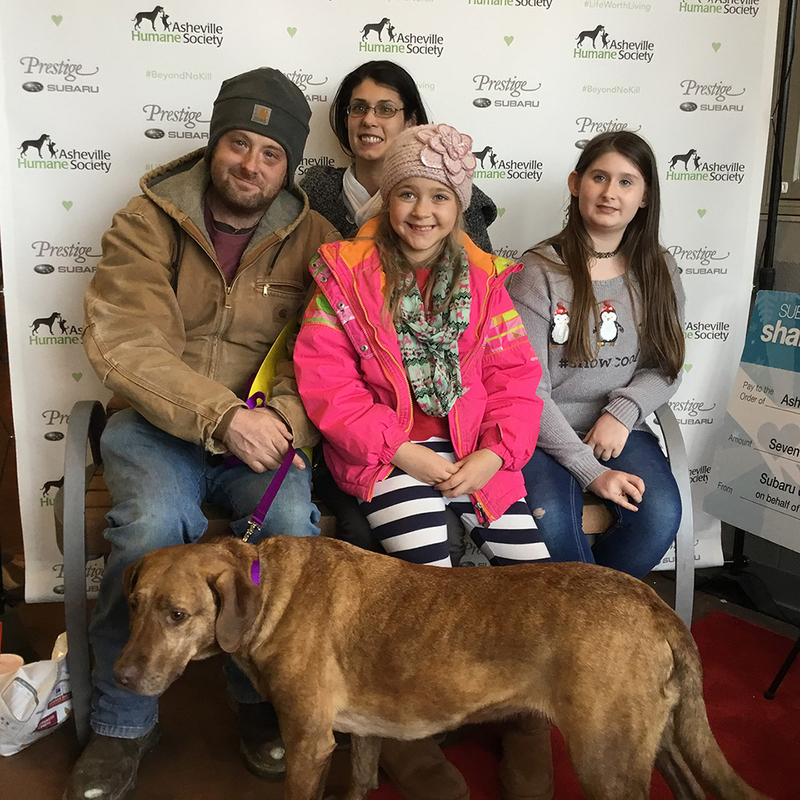 After about 10 weeks of treatment, Sweetie was adopted by a local family, Karla and Matthew P. and their children. Asheville Humane Adoption Coordinator Sydney Bartson said the family was prepped ahead of time on Sweetie’s demeanor. So they knew that she might not want to solicit attention right off the bat, but when brought to the yard where the Paynes were waiting, she headed right to Matthew. Life’s pretty sweet for Sweetie now. Karla Payne reported back to Asheville Humane that she eats well, sleeps by their bed (moving to the bed once they’re up in the morning) and gets several walks a day where she behaves like a pro on-leash. And what about Sweetie’s running partner? The BRC is looking for a shelter partner to facilitate Honeysuckle’s adoption, and she’ll hopefully be heading home soon!